The Fourteenth Annual General Meeting of Vijaya Bank was held on 27.06.2014 at its Head Office at Bangalore. The bank has declared final dividend of Rs.1 per share (10%).This is in addition to the interim dividend of Rs.1 /- per share declared earlier in january,2014. INDIA IS CURRENTLY THE WORLD'S LARGEST ARMS IMPORTER. period ,India accounted for 14% of all international imports. Source : Jeremy Bender,Business Insider & Yahoo Finance,India. Mr.Merkera Rao with Mr.Sanjiv Patel addressing Media. 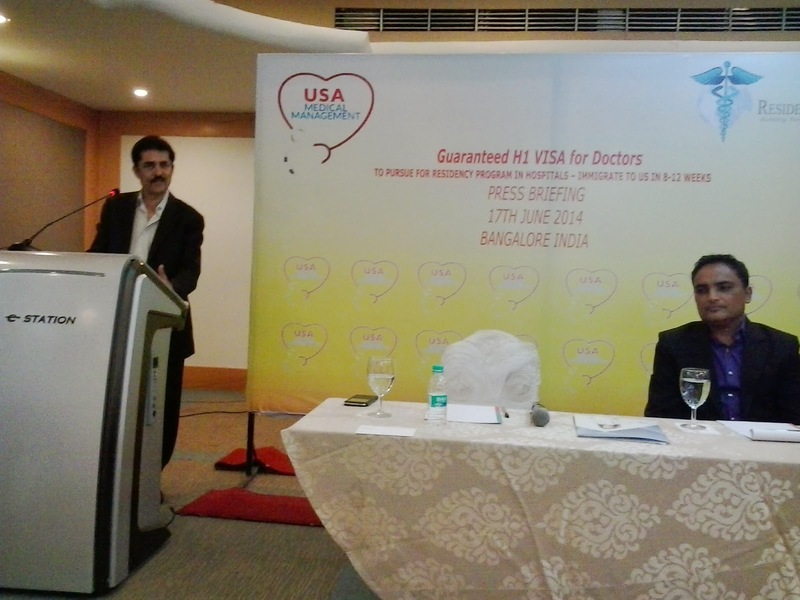 with the help of Resident Medical Group(RMG) & USA Medical Management based in Los Angeles . for one year with stipend of USD2500.They must undergo USMLE 1&2 prep,ECFMG and so on. Before making any decision they are advised to visit www.usamedicalmanagement.com & www.residentsmedicalgroup.com for further details. Mr.Arvind Kejriwal,who was the Chief Minister of Delhi for 49 days. list and the Congress party was in power both at the centre and in state. the people of Delhi from their problems. 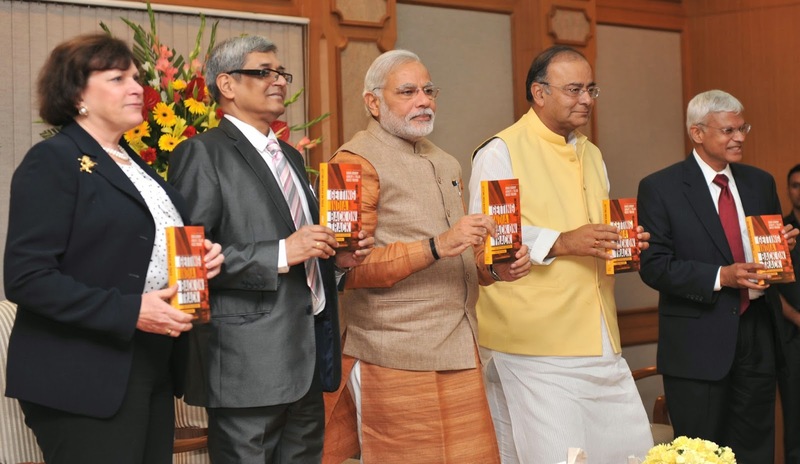 Prime Minister Narendra Modi Releasing the Book" Getting India Back on Track-An Action Agenda for Reform. This book has been published by Carnegie Endowment for International Peace.The foreword has been written by Ratan Tata.The book contains insightful essays by eminent academicians and public policy experts.This book is edited by Bibek Debroy,Ashley J Tellis & Reece Trevor. The papers in the book deals with subjects like macro economy,fiscal,agricultural,manufacturing ,defence,law & order and foreign policy. Courtesy: Yahoo News India & photo- PIB. Internal Revenue Service(USA) nets Offshore Data from 77,000 banks. registered under FACTA ( The Foreign Account Tax Compliance Act). government help to the IRS means almost no foreign account is secret. The government has set up the SIT under Supreme Court monitoring. counterparts in US to know their approach to make the foreign banks comply with their request. a position that has pledged to adopt by the end of 2015. Source: Global Financial Integrity & Forbes. INDIAN RUPEE WEAK AGAINST DOLLAR. give various reasons why the rupee is weak against the US Dollar. is not fully convertible and hence we donot know the real value of our rupee against other currencies. How we compare against China in various parameters. vis-a-vis 1USD rate(%) (%) of GDP in USD. Data Source: Collected from various sources. THE NEW RAILWAY MINISTER'S PRESS MEET. Corridor linking Chennai,Bangalore & Mangalore.He said Port connectivity is important for development. Security and they are open to invite Mr.E.Sreedharan,an expert to head the committee.